born Oct. 21, 1790, Mâcon, Fr. French poet and statesman whose lyrics in Méditations poétiques (1820) established him as one of the key figures in the Romantic movement in French literature. Alphonse’s father, an aristocrat, was imprisoned during the culminating phase of the French Revolution known as the Reign of Terror but was fortunate enough to escape the guillotine. Alphonse was educated at the college at Belley, which was maintained by the Jesuits though they were suppressed in France at this time. Lamartine had wanted to enter the army or the diplomatic corps, but because France was ruled by Napoleon, whom his faithful royalist parents regarded as the usurper, they would not allow him to serve. Thus he remained idle until the Bourbon monarchy was restored in 1814, when he served in Louis XVIII’s bodyguard. The following year, however, Napoleon returned from exile and attempted to rebuild his empire during the Hundred Days. Lamartine emigrated to Switzerland. After Napoleon’s defeat at Waterloo and the Second Bourbon Restoration, he abandoned the military profession. Attracted to literature, he wrote some tragedies in verse and a few elegies. By this time his health was not good, and he left for the spa of Aix-les-Bains, where, in October of 1816, on the shore of Lake Bourget, he met the brilliant but desperately ill Julie Charles. Early in 1812 Lamartine had fallen deeply in love with a young working girl named Antoniella. In 1815 he had learned of her death, and later he was to recast her as Graziella in his prose “anecdote” of that name. He now became passionately attached to Charles, who, because of her vast connections in Paris, was able to help him find a position. After her death in December 1817, Lamartine, who had already dedicated many strophes to her (notably “Le Lac”), devoted new verses to her memory (particularly “Le Crucifix”). In 1820 Lamartine married Maria Ann Birch, a young Englishwoman connected by marriage to the Churchills. The same year he published his first collection of poetry, Méditations poétiques, and finally joined the diplomatic corps, as secretary to the French embassy at Naples. Méditations was immensely successful because of its new romantic tone and sincerity of feeling. It brought to French poetry a new music; the themes were at the same time intimate and religious. If the vocabulary remained that of the somewhat faded rhetoric of the preceding century, the resonance of the sentences, the power of the rhythm, and the passion for life sharply contrasted with the often-withered poetry of the 18th century. The book was so successful that Lamartine attempted to extend it two years later with his Nouvelles méditations poétiques and his Mort de Socrates, in which his preoccupation with metaphysics first became evident. Le Dernier Chant du pèlerinage d’Harold, published in 1825, revealed the charm that the English poet Lord Byron exerted over him. Lamartine was elected to the French Academy in 1829, and the following year he published the two volumes of Harmonies poétiques et religieuses, a sort of alleluia, filled with deist—and even occasionally Christian (“L’Hymne au Christ”)—enthusiasm. That same year (1830), when Louis-Philippe acceded to the throne as constitutional monarch after the July Revolution, Lamartine abandoned his diplomatic career to enter politics. He refused to commit himself to the July Monarchy, however, and, preserving his independence, he set out to draw attention to social problems. After two unsuccessful attempts he was elected deputy in 1833. Yet he still wanted to write a poem, Les Visions, that he had been thinking about since 1821 and that he had conceived of as an “epic of the soul.” The symbolic theme was that of a fallen angel cast out of heaven for having chosen the love of a woman and condemned to successive reincarnations until the day on which he realized that he “preferred God.” Lamartine wrote the last fragment of this immense adventure first, and it appeared in 1836 as Jocelyn. 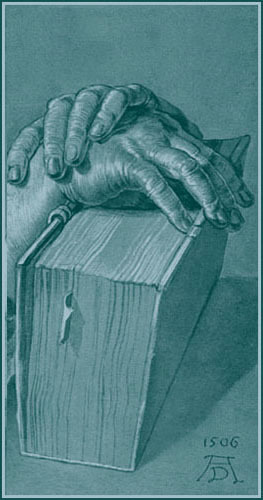 It is the story of a young man who intended to take up the religious life but, instead, when cast out of the seminary by the Revolution, falls in love with a young girl; recalled to the order by his dying bishop, he renounces his love and becomes a “man of God,” a parish priest, consecrating his life to the service of his fellow men. In 1838 Lamartine published the first fragment of this vast metaphysical poem under the appropriate title La Chute d’un ange (“The Fall of an Angel”). In 1832–33 he travelled to Lebanon, Syria, and the Holy Land. He had by then definitively lost the Catholic faith he had tried to recover in 1820; a further blow was the death in Beirut, on Dec. 7, 1832, of his only remaining child, Julia. A son born in Rome in 1821 had not survived infancy. 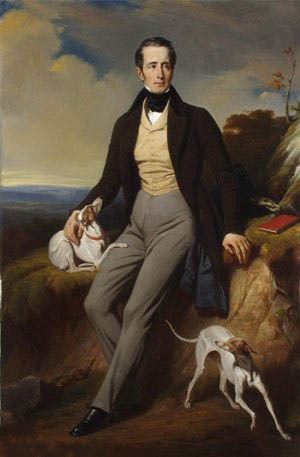 After a collection published in 1839 under the title Recueillements poétiques (“Poetic Meditations”), Lamartine interrupted his literary endeavours to become more active as a politician. He was convinced that the social question, which he himself called “the question of the proletariat,” was the principal issue of his time; he deplored the inhumanity of the worker’s plight; he denounced the trusts and their dominant influence on governmental politics, directing against them two discourses, one in 1838, another in 1846; he held that a working-class revolution was inevitable and did not hesitate to hasten the hour, promising the authorities, in July 1847, a “revolution of scorn.” In the same year he published his Histoire des Girondins, a history of the right, or moderate, Girondin Party during and after the French Revolution, which earned him immense popularity with the left-wing parties. After the revolution of Feb. 24, 1848, the Second Republic was proclaimed in Paris, and Lamartine became, in effect, head of the provisional government. The propertied classes, who were at first startled, pretended to accept the new circumstances, but they were unable to tolerate the fact that the working class possessed arms with which to defend themselves. 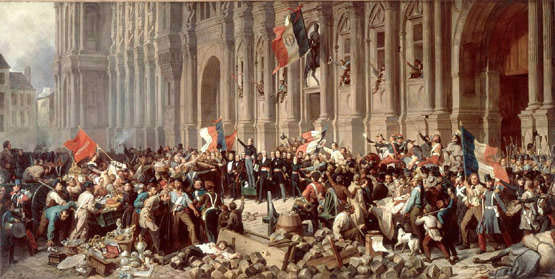 In April 1848 Lamartine was elected to the National Assembly by 10 départements. The bourgeoisie, represented by the right-wing parties, thought they had elected in Lamartine a clever manipulator who could placate the proletariat, while military forces capable of establishing order, such as they conceived of it, were being reconstituted. The bourgeoisie was enraged to discover, however, that Lamartine was, indeed, as he had proclaimed himself to be, the spokesman of the working class. On June 24, 1848, he was thrown out of office and the revolt crushed. A broken man, Lamartine entered the “twilight” of his life. He was 60 years old in 1850, and his debts were enormous, not because he had been personally extravagant but because of the allowances he gave his sisters to compensate for the total property inheritance he had received as the only male in the Lamartine family. For 20 years he struggled desperately, though in vain, against bankruptcy, publishing book after book: Raphaël, a transposed account of his love for Julie Charles; Les Confidences and Nouvelles Confidences, wherein he intermingled real and imaginary elements (Graziella is a fragment of it); novels: Geneviève (1851), Antoniella, Mémoires politiques (1863), the last work being of great historical interest; a periodical titled Cours familiers de littérature (1856–1868/69), in which he published such poems as “La Vigne et la maison” and “Le Désert”; some historical works that remained unequaled, including Histoire des Constituants (1854), Histoire de la Restauration (1851–52), Histoire de la Russie, Histoire de la Turquie. He died nearly forgotten by his contemporaries.